ATN NVMPAN143P NVM14-3P ITT Pinnacle Night Vision Monocular FREE SHIPPING! 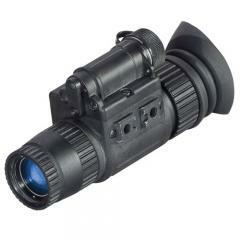 The ATN NVM14-3P ITT Pinnacle is an extremely versatile night vision monocular. It can be used as a handheld device, head or helmet-mounted, or attached to a weapon. The Pinnacle is even compatible with most infrared laser systems for use in a variety of tactical condition. The powerful, third-generation intensifier provides a high level of clarity and contrast in low-light conditions. Total Darkness Technology employs an infrared flood illuminator for high visibility, even with zero ambient light. High quality, multi-coated optics maximize light transmission for exceptional clarity. The device includes automatic brightness adjustment and bright light cut-off functions to instantly adjust to changing light levels and protect the intensifier tube. Simple digital controls ensure the Pinnacle is user-friendly, while infrared and low battery indicators located in the viewfinder add to ease of use. The monocular is built for high levels of resilience and can be submerged up to 66-feet without damage. ©2002-2019 CopsPlus.com: ATN NVMPAN143P NVM14-3P ITT Pinnacle Night Vision Monocular FREE SHIPPING!